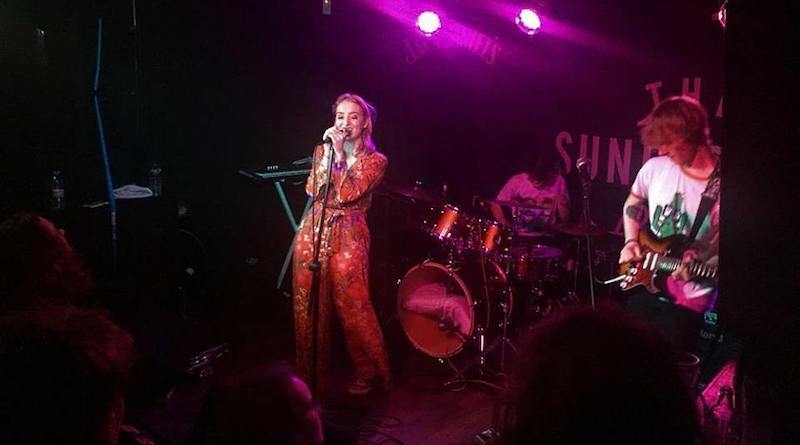 Last Friday, the bottom floor of The Sunflower Lounge became alive with the sound of music when four local artists took to stage to put on a show for a steadily building cluster of music lovers. The boys at Baddies Boogie yet again mustered up some class brummy acts which oh-so-lovingly fed the room with tastes of their new and original stuff as well as some “boogie” evoking covers. To begin the night, 18 year old Emily Cribb whipped up a chilled and relaxed vibe with her acoustic stylings and sweet voice. Cribb, with her mature, sticky sweet vocals and beautiful lyrics began her set with her own song, ‘Rose’, as well as taking on her own rendition of ‘Someone You’d admire’ by Fleet Foxes which seemed to cause a hum of delight from the crowd. Cribb showcased her talents further as she transitioned from guitar to piano to give us some more of her originals such as ‘Crossroads’ as well as a debut performance of a nameless track. We will be waiting to see more from this lovely songstress. Next came a change in tone in the form of Wolverhampton band Second Hand Genes. A vision in denim and lots of good hair, this five piece band made up of Will Turner, Matt Dutton, Sam Hadley, Liam Gamston and Matt Wildman brought an indie rock sound to the fore which urged the steadily filling room to nod along. Their tracks, such as their newly released ‘Headache’, ‘E-Numbers’ and a cover of Weezer’s ‘Say it Ain’t So’, made it impossible not to tap your foot along with the grungey guitar riffs and classic harmonies. They seemed to leave the best till last as they erupted with their song ‘Maybe’- a tasty track which would not look out of place on an emo anthems Top 50. With some of the crowd already singing their lyrics, we’ll definitely be hearing a lot more from Second Hand Genes. Switching it up yet again, The Institutes temporarily turned The Sunflower Lounge into a house of bluesy rock as Andrew Ferris, Andy Hall, Andy Lowe and Dom Carr took to the stage. Kitted with beards and stylish leather, the band brought a classic rock feel- filling a small venue with an immense sound. Armed with a harmonica, Ferris and the rest of the band began their set with their own ‘You Stole My Baby’, ‘Take My Hand’ and other new releases. Their gritty sound stood out amongst the rest and evoked lots of movement and headbanging from the crowd. With the sudden emergence of lots of phones longing to capture their set, you could tell the room was falling for them. The Sunset Beach Hut finally graced the stage, bringing some summer vibes and up beat tempos to the otherwise rock and roll night. This terrific trio consisting of Aphra Smith, Benjamin Thomas and Matty George used funky backing tracks and tremendous instrumental skills to give us tunes which are definite must haves on your 2018 summer vacation playlist. Taking the crowd to a land filled with palm trees and lilos, this small but great band played their newest release ‘Comfort’, as well as letting us all be a part of the making of their brand new music video. The lively three also played their latest release ‘The Tide’ and got the crowd jumping and dancing as they played their own take of Bombay Bicycle Club’s ‘Luna’. A great bond between the three could be felt around the room, making them a treat to watch as well as party with. They successfully left everyone in high spirits as the night came to a close. English Literature and Sociology graduate, building up writing experience wherever I can. Currently writing for Counteract as well as writing poetry, poetry analysis and short stories for my own blog.